For Star Wars fans, a new trailer is something to get excited about – and Lucasfilm knows how to build the hype. A day before the release of a trailer for the highly anticipated "Star Wars: The Last Jedi," an 11-second preview of it could be discovered on Twitter. The actual trailer will premiere in the US during Monday Night Football's halftime on October 9, launching the pre-sale of tickets to see the movie, set for worldwide release on December 15, 2017. A previous official teaser had been released last April. It was watched over 40 million times on Youtube. Though few details are known, the story continues to follow Daisy Ridley as Rey as she fights her way through space. The eighth Star Wars movie also stars Mark Hamill, Adam Driver, John Boyega and Oscar Isaac, as well as the late Carrie Fisher. The storyline is also said to contain a fitting send-off for Princess Leia, whose role will come to an end after the death of Carrie Fisher last December. This is how we knew her, and it's how we will always remember her - as Leia Organa, leader of the rebellion against the Empire. Fisher played the role for the first time when she was just 19. In six "Star Wars" segments (including "Rogue One") she filled the role of the courageous Princess with life. In "Shampoo" (1975) Fisher appeared on the big screen for the first time. In this comedy, she seduces Beverly Hills hairdresser George Roundy (played by Warren Beatty). "Shampoo" received one Academy Award along with several more Oscar and Golden Globe nominations. Later, Fisher decried that Beatty had asked her to act in front of the camera without a bra. A mere two years later, Fisher plays Princess Leia for the first time. In "Star Wars episode IV: A New Hope" she and droid R2-D2 (pictured) try to neutralize the devastating Death Star (a moon-shaped space station). That film received a whopping six Oscars - and Carrie Fisher would be part of a highly successful ensemble cast from now on. Carrie Fisher and Mark Hamill shared screentime in three "Star Wars" installments, playing twins Leia Organa and Luke Skywalker, respectively. Their last collaboration was "Star Wars Episode VII: The Force Awakens" in 2015. Hamill has expressed deep sadness over the loss of his colleague. Han Solo (played by Harrison Ford) is not a volunteer but is rather dragged into the mission of saving the galaxy. However, Luke, Leia and the smuggler-turned-rebel leader develop into a powerful alliance. This "Star Wars" episode also marked Harrison Ford's breakthrough in Hollywood. Throughout the 1970s and 1980s, Fisher had an on-and-off relationship with Paul Simon (of Simon & Garfunkel fame). They were even married for two years (1983-4). Simon's song "Hearts and Bones" is a tribute to his relationship with the actress. In 1980, Fisher switched from the "Star Wars" set to that of "Blues Brothers." In this legendary comedy, Fisher played the ex-girlfriend of protagonist Jake (John Belushi). She fires at him with an assault rifle for walking out on her. Allegedly, there was a cocaine bar on the set, and Fisher's job was to keep Belushi away from the drugs. In several "Star Wars" segments, the droid C-3PO - a human robot - acted as Princess Leia's companion - including her imprisonment as a slave to evil Jabba the Hutt. The talkative robot was brought to life by actor Anthony Daniels. Another member of the "Star Wars" combat team led by Luke Skywalker and Princess Leia was Chewbacca. The furry Chewie, a member of the Wookiee species, is played by Peter Mayhew, an actor who is 2,21m (over seven feet) tall. When Fisher had suffered her heart attack, Mayhew posted a tweet headlined, "Thoughts and prayers for our friend and everyone's favorite princess right now." 1989 saw Fisher appearing in another comedy: "When Harry Met Sally." She played Marie, the best friend of heroine Sally (Meg Ryan). In the movie, she has a brief relationship with Harry (Billy Crystal) before eventually marrying his friend Jess (Bruno Kirby). Han Solo and Princess Leia have a son, Kylo Ren, who has deserted to the other side and become a dark warrior of the Force. She continues to lead the rebellion, including the one against the New Order. Fisher and Harrison Ford were not just close as film characters. In her autobiography, "The Princess Diarist" (2016) she mentions details of the affair they had during the 1976 filming. In addition to her acting career, Fisher published a total of eight books, including five novels. Lately, she published her autobiography, "The Princess Diarist" - her third memoir after "Wishful Drinking" and "Shockaholic." Suffering from a bipolar disorder and drug addiction herself, Fisher kept adressing psychic illnesses and addictions. In 2016 she received a Harvard University "Lifetime Achievement Award in Cultural Humanism" for her public engagement. On 27 December, she passed away after complications arising from a massive heart attack. Carrie Fisher passed away on the morning of 27 December, 2016, as a result of a severe heart attack suffered a few days before. She had collapsed on a long-distance flight from London prior to touchdown in Los Angeles and had received treatment at UCLA Medical Center. According to media reports she had just finished work on the British sitcom "Catastrophe." The preview of the trailer had many enthusiastic fans drooling in anticipation of the first glimpse into the latest Star Wars storyline; still, director Rian Johnson warned purists against watching, saying he was torn because the trailer was so good but ultimately might be too revealing. The Force is big in Moscow -- that is, the force that rules in the Star Wars galaxy. 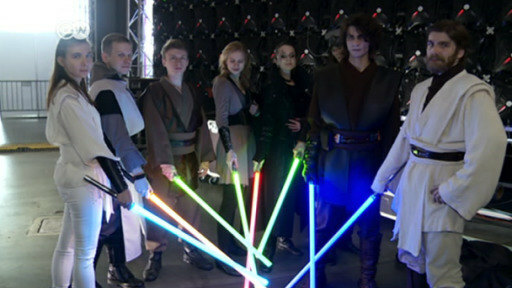 Even though the hit films weren’t shown officially in the Soviet Union until its final years, there’s now a school where budding saber fighters are out in – force.